collaboration, first step are those shoes. On the first picture you can see the clean version. I love GREEN, every single color palette including GREEN. That`s why i wanted to have proper green elements in it. What are you thinking...?! Let us know it! Would love to hear what`s on your mind. Thanks for visiting my blog. Enjoy every single moment of your stay in NYC, I wish I could be there. I'm so sad I'll have to wait to go back. Maybe I'll find an internship in two years, who knows ! 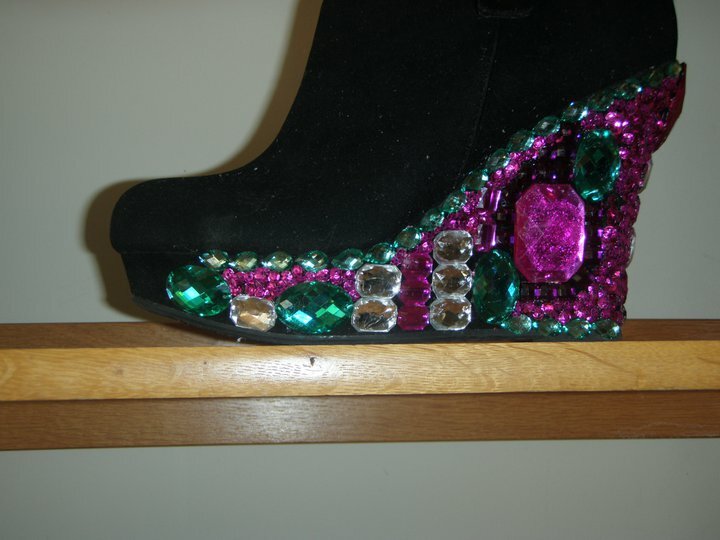 Ooooh jewels on shoes, I love that! Very creative, I love diy projects! OMG that is the best diy EVER! i love the beige ones!! they look great!!! omg! that is awesome! But I like the first one more! really nice!! THANK U SOOO MUCH u guys!!!! If u wanna order some of those, just let me know it and we will get in touch!! Your blessed with a stunning talent! !this idea is so unique "pimping heels":)...i wish u track load of success in this business project.I love your blog:)...Blessings! !x.